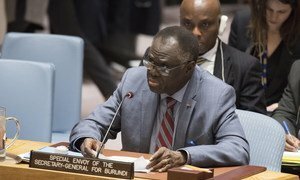 Michel Kafando, Special Envoy of the Secretary-General for Burundi, briefs UN Security Council members on the situation in the country. On the political front, Mr. Kafando noted that Burundian President Pierre Nkurunziza reiterated on 22 December 2018 his decision not to seek a new mandate in 2020 and that the request for official recognition of the new opposition party, the National Congress for freedom, was finally approved on 14 February by the Government. “I encourage the Government to continue in this direction and urge it to be more inclusive, particularly in the context of ongoing discussions on the adoption of a new Electoral Code,” he said, recalling that the general elections, including the presidential election, were scheduled for sixteen months. The Special Envoy also noted that the human rights situation remains a concern in Burundi according to the Office of the United Nations High Commissioner for Human Rights (OHCHR). At the same time, he said the humanitarian situation had improved since 2017, except in some parts of the country, particularly in the eastern and north-eastern border provinces. “About one and a half million people, however, remain threatened by food insecurity because of persistent socio-economic difficulties,” Mr. Kafando warned. As of December 31, 2018, the UN estimated that 140,000 people were displaced and more than 347,000 were still Burundian refugees in neighboring countries (down from 380,000 refugees last November). The Special Envoy traveled to Burundi from 20 to 29 January, with the intention of holding talks with President Nkurunziza and the Burundian authorities on the conclusions of the Security Council meeting of 21 November 2018, but also to reaffirm on the eve of the East African Community (EAC) Summit, United Nations support for the inter-Burundian process. “Unfortunately, these talks could not take place,” Mr. Kafando reported , explaining that he then proceeded to Kampala, Uganda, on 31 January for a working visit with President Yoweri Museveni, mediator of the inter-Burundian dialogue. He later travelled to Arusha for the summit of the East African Community on 1 February, which tasked the Presidents of Kenya, Uganda and Tanzania to pursue the mediation. Mr Kafando concluded by suggesting that if the Council intended to issue a press statement, it should encourage mediation and relay the Secretary‑General’s support for such a process. "All proposals must bear in mind a single objective: that the inter-Burundian dialogue remains the only viable option for resolving the political crisis and the holding of peaceful elections in 2020, in the spirit of the Arusha Peace and Reconciliation Agreements," he said.